Olive Garden Stuffed Mushrooms some of the best known stuffed mushrooms. These stuffed mushrooms have been on the menu at the Olive Garden for many years now. You can make these at home for much less than at the restaurant. They are easy to make, and you can make as many as you want. Everyone loves mushrooms. One of the best ways to make mushrooms is to serve them stuffed. 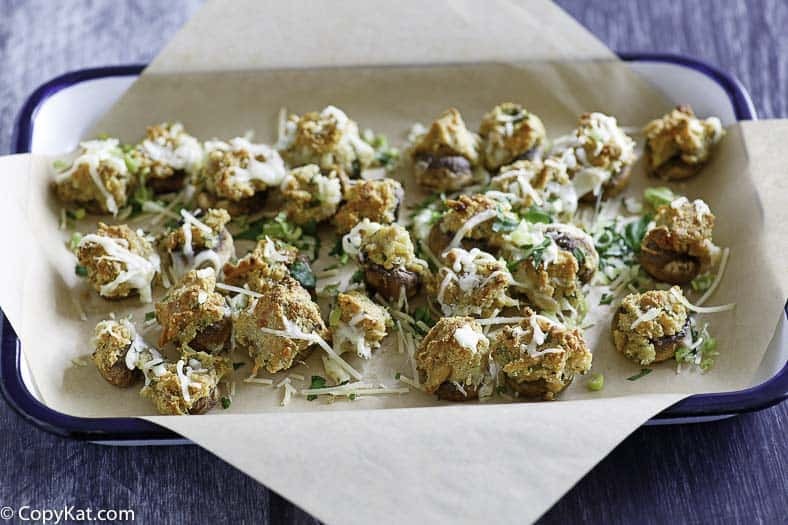 These make the perfect appetizer, or snack to be served at your next party. Love stuffed mushrooms? 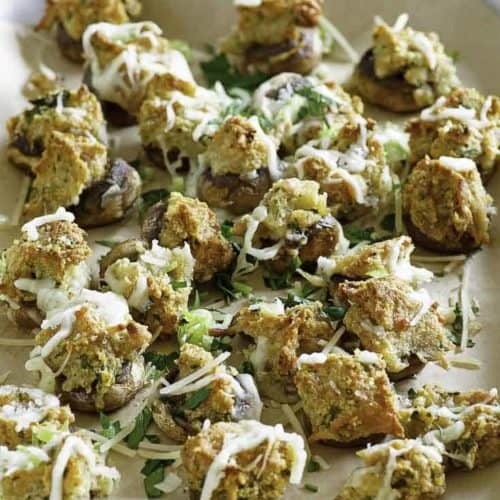 Be sure to try these stuffed mushroom recipes. Wash mushrooms and remove stems, pat dry. Save stems for another recipe. Drain the clams, reserve liquid for another recipe. In a mixing bowl, place clams, onions, garlic salt, minced garlic, soft butter and oregano. Mix thoroughly. Add Italian bread crumbs, egg, and clam juice and blend. Stir cheeses in clam stuffing and mix well. Place clam mixture inside the mushroom cavity and slightly mound clam mixture. You should be able to stuff between 8 and 12 mushrooms depending on the size of mushrooms. Place mushrooms in the lightly oiled baking dish. Pour melted butter over mushrooms. Cover and place in a preheated oven at 350 degrees for about 35 and 40 minutes. 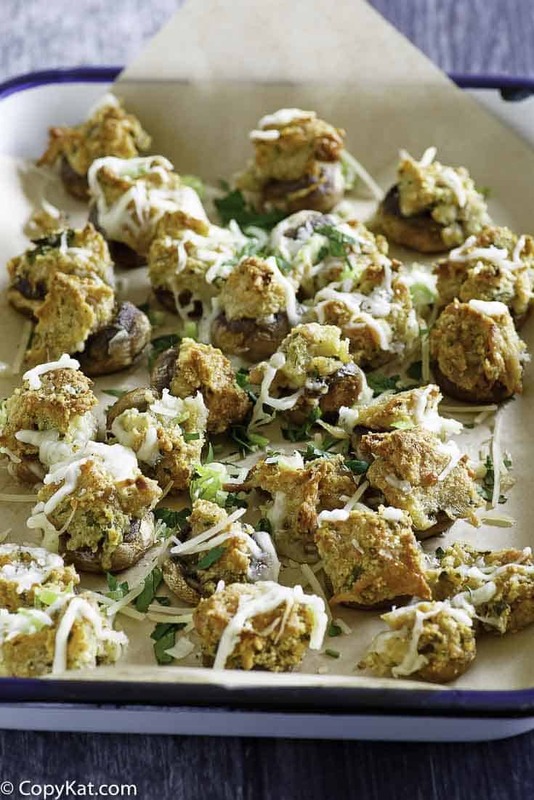 Remove cover, sprinkle freshly grated mozzarella cheese on top of the mushrooms and pop them back in the oven just until the cheese melts slightly. Garnish with freshly diced parsley. You can find more Olive Garden Recipes at CopyKat.com, the web's most popular destination for copycat restaurant recipes. Pls maybe change recipe ingredients list to clams drained (save clam juice for recipe)?! These weren’t bad 😉 We enjoyed them. I could only find 10 ounce cans of clams. I doubled the recipe and included the stems, chopped finely, in the stuffing. My wife raved about them, so it was a success. Can I prepare these the night before? If you use clams a and fresh crab meat do you need something else to moisten ? I’m not big on clams or anything else in the seafood line. I do like salmon. Could the salmon be used in place of the clams? I made a double batch. 10 with clams and 10 with crawfish meat. With the crawfish I used seafood stock for the clam juice, Old Bay for the oregano and regular bread crumbs for the Italian style. Could not tell you which disappeared first because I didn’t get any by the time I got outside to join in! Oh I bet that was delicious! It’s too bad you didn’t get any of them! These were outstanding! Delicious and easy too. These are awesome, it’s like having Olive Garden at home! Yummo! You can use “imitation crab” finely chopped too! It’s amazing.. ty!! I made these stuffed mushrooms for my parents 50th anniversary party! They disappeared so fast! I think I found the majority of the appetizers for their party on this site! Our food was so good it was gone so fast! I am so glad these worked out for you. You use the melted butter at the end, and the softened butter to mix with. The tablespoon at the end.